Hanka Venselaar is from Nijmegen, Netherlands. In her daily life is a scientist working in bioinformatics at the Radboud University, Nijmegen. 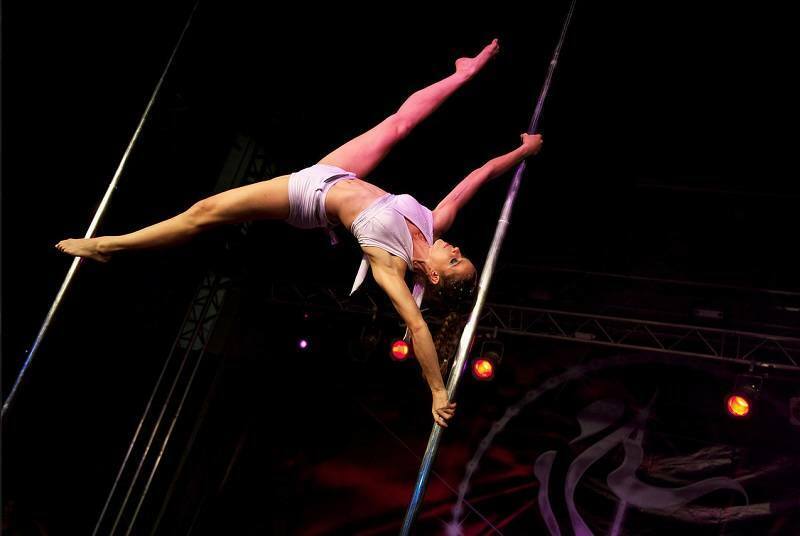 In her free time teaches and performs as a Pole Dancer and Aerial Silks Artist. She has been a competitive gymnast for over 14 years. Since 2006 she has applied all of her experience in gymnastics into the field of Pole Dancing. In 2010, 2011 and 2012 she won the title of European Pole Dance Champion and the prize for “Best Pole tricks” at the world championships 2011. 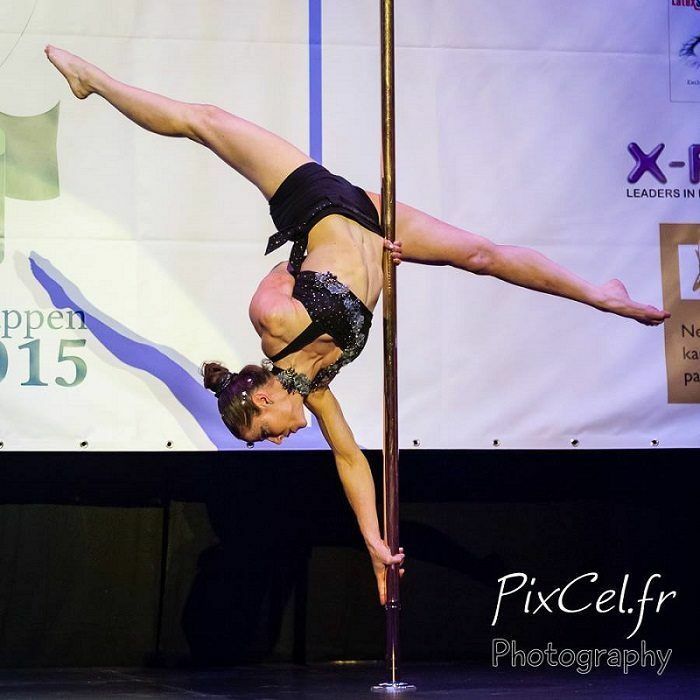 Ιn 2015 she won the Dutch international Pole Art, the Dutch Nationals, she placed 2nd at Pole Expo Classic and made it into the Worlds finals! Her other specialty is Aerial Acrobatics which has been performing since 2004. She loves Aerial Silks and the last year she started doing a new act, Aerial Cube. Maybe you have seen her in Hollands Got Talent! 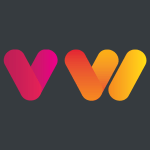 Hanka Venselaar we would wholeheartedly like to thank you for accepting our invitation and honouring us with your interview that is hosted here on Vertical Wise. What brought you to Pole Dancing? What is your performing experience like? How long have you been performing? I’ve been performing from the start. The studio where I started, asked for a final exam-dance (only 1,5 minute) before you could move to the next level. But I flew through the course and did that exam in my 2nd class. So, I guess that was my first experience. But as a gymnast I was more or less familiar with performing. My first acts where all very trick-based of course, it was only later that I realized that dance and artistry are also important. Since then, I try to be more an all-round performer, although you can still see the gymnast in me. I love performing even more than competing I think because it’s less stressful, and in general you have less strict rules. I also like to be creative and try new ideas. For Pole Theatre UK, for example, I combined pole with silks… something that is usually not possible. I’d say…bring on the performances! This is difficult to answer. It really depends on my week, whether I am travelling or teaching a lot, and also on my normal job. I work part time as a scientist at the hospital in Nijmegen. I usually try to train almost every day, but when work is very demanding, I can’t go. Also, I teach group classes at the university sports centre one night per week and people book privates and performances too…. So basically I try to train whenever I am free. Have you made sacrifices for Pole Dancing and what were those? I sacrifice time, always. Being a Pole Dancer on this level is becoming increasingly difficult. 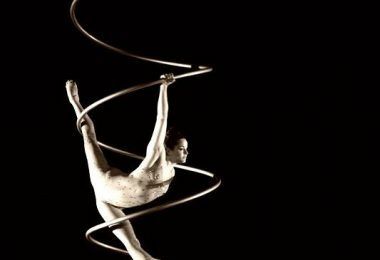 The sports is getting more and more professional and nowadays athletes have a team of trainings, choreographers, therapists, contortion trainings to help them out. To keep up with that I make sacrifices in time I would normally like to spend with friends, family and my boyfriend. The good thing is that they have always known me as a gymnast who was also training every day, so they are used to it. Besides Pole Dancing, are you involved in any other activities? Besides my normal job? I train Aerial Silks and Aerial Cube too. 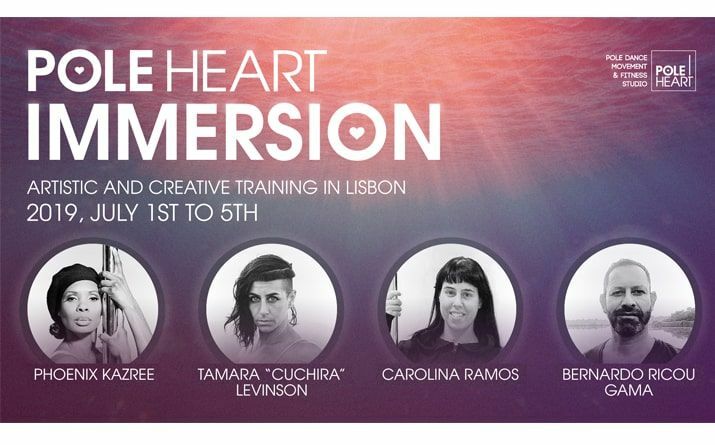 I run my own company to do performances and workshops, also in these disciplines. To improve my dancing skills I also do a contemporary dance class once a week. I try to eat healthy and clean. I’m a vegetarian so no meat for me and I need to think how to substitute for the lost protein. The good thing is that I love all vegetables so most of the healthy part is covered. I try to stay away from processed foods and sugar…although you can feed me chocolate any time! I have one motto: Have fun! If it is no fun for you, then don’t do it! I sometimes see students that want to compete, but totally freak out about it. Nobody forces you to compete, so you don’t have to. But if you decide to do it, put your heart in it and try to be your best. It might not be the winning act, but if you make sure that you have fun training and performing your act…you can never loose. I think very recently everything I have learned in the last years came together during a show I organized here in Nijmegen. It was called Pole Evolution and told the story of human evolution in 18 different group acts. I’ve been in many nice and beautiful shows during the years and I used my experience as a performer to put together this one. I knew what kind of information and experience you need as a performer, and as a big fan of shows I also knew what I wanted to see from an audience point of view. I organized the theatre, the stage (we had a truss, 3 tall poles, silks, and cube) and contacted other studios who all choose a certain era of our history. I was not responsible for the group acts (except for my own group who did the openings act together with my own cube act). When I saw all the shows during the run through I was surprised and amazed by the ideas and creativity…and when everything went very well during the evening and the audience went wild, I knew we had done something cool…. So, so far this has been the proudest moment I guess! Did you ever feel at risk during performance? Don’t forget your basics! Almost all of the cool moves can be broken down into basic moves like for example, handstands, inside legs hangs or split hands positions. If you can’t do those, you cannot do the moves that require them. Not everyone sees that, and sometimes it is difficult to analyze a move or combo. I see people just randomly trying to mimic moves they see on Facebook or YouTube. But they forget that there is a full process of training, trying and (probably) failing, that is not shown on that video. So, work on your basic things to make sure you can always safe yourself and that you are strong enough to do more difficult things. 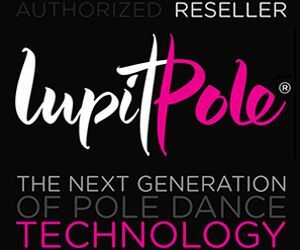 Oooff…difficult question, pole has gone through an enormous amount of changes and developments. (As I said, when I started Jade was something only shown during Worlds). 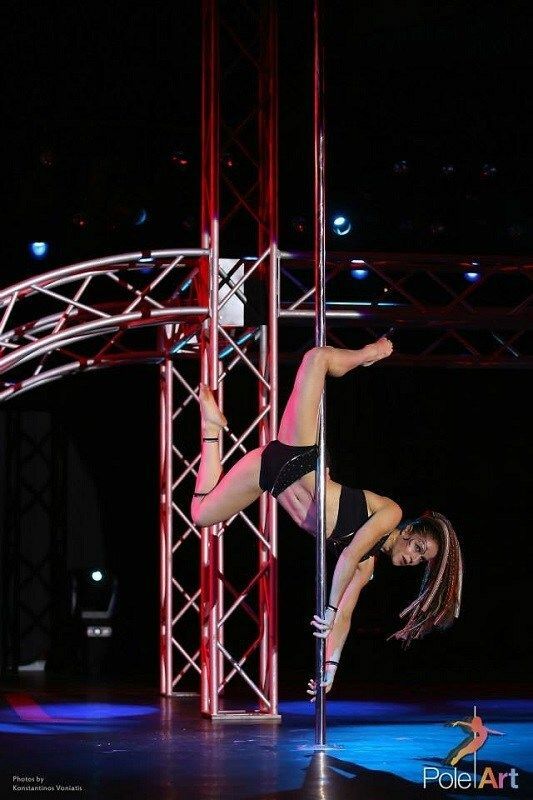 As every pole lover I would love to see pole become an Olympic sport, simply because that would mean the ultimate form of acceptation of what we do. However, I do see the developments to get there and I’m not sure I like them. I did compete in IPSF competitions and I feel the set of rules is limiting the artists in us. Not all acts are interesting to watch and you see the same moves over and over. However, I do understand they have to start somewhere, and it is probably a good start. I also have a lot of respect for the people that are putting it all together, because that’s not an easy task. I think pole sports will for sure develop more. On the other hand, I think the more arty side of pole will stay strong and maybe the two types will even grow further apart. I would love to see more initiatives like Pole Art and Pole Theatre competitions, and of course pole shows, in more countries to give everyone the chance to be a performer. But no one can predict the future, so I am curious what will happen. The only thing I am sure of is that pole has established itself as a real sport and more and more people are enjoying the beauty of it. I am proud to be part of the pole world! Studio Ad Astra is her own small company that enables her to teach and perform professionally.